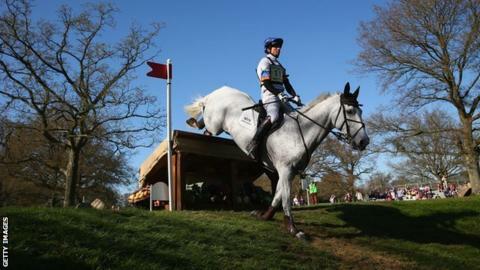 Britain's Francis Whittington lies second on Easy Target after the opening day's dressage at the Badminton Horse Trials. The Sussex-based rider is just 0.2 penalties behind 2010 champion Paul Tapner and his mount Kilronan. Tapner's fellow Australian Lucinda Fredericks is third aboard Flying Finish with 39 points. New Zealand's former double Olympic champion Mark Todd is 1.5 points further back in fourth on NZB Campino. Whittington, a former equine dentist who is ranked 132nd in the world, scored 36.2 which was more than 15 penalties better than their dressage performance last year. "There was a belief we could do a dressage test in the 30s," he said. "I felt quite relaxed going into the arena, but come Saturday (cross-country day) it is going to be a totally different ball game. "I have been in a position where I have produced good dressage scores here before, but in the past I have also ended up doing the walk of shame home on the cross-country course." William Fox-Pitt, who won his third Kentucky title in five years on Bay My Hero last month, trails in 28th place after picking up 53.8 penalties on Cool Mountain.